A Path Forward for Communities and Regions | Strategic Networks Group, Inc.
SNG recommends the following path forward for communities and regions that is a step-by-step approach to planning that saves time and money, as well as avoids many of the classic broadband project pitfalls such as focusing only on the business case for broadband but not the economic case for broadband, assessing broadband assets (i.e. supply) but not assessing broadband marktet demand, building a network and expecting subscribers but not growing broadband demand. Start with assessing whether there is enough demand along with the economic feasibility of investing in broadband, digital infrastructure and transformation – do economic and community benefits outweigh the costs over 15-20 years? Make a Go / No-Go decision to take next steps with broadband and digital infrastructure. Immediate next steps include assessing your community’s readiness, as well as quantifying potential market demand and potential subscriber service commitments. Assess community readiness – engage elected officials, local leaders, and key stakeholders to ensure you have what it takes to get your project across the finish line. 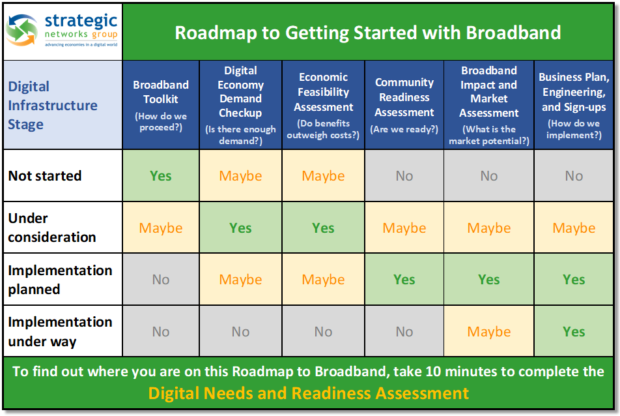 Assess market demand for broadband, digital infrastructure, and smart community services – is there enough committed demand to sustain the network and smart community services? Can you aggregate demand and drive commitments (service sign-ups) so you build to committed demand? Develop operating model and business plan based on data points and insights from market demand analysis and economic feasibility assessment. Make a Go / No-Go decision to invest in design and engineering and prepare for network build. Solicit bids for design and engineering. Solicit bids for building and operating the network. Most communities do not have the capacity nor experience to build, operate, or provide services over a network. SNG recommends communities maintain ownership of the infrastructure so they can own their digital future. Finance the build based on quantified benefits from municipal cost reductions, subscriber savings, local economic growth, and smart community services over 15-20 years. Include in the capital financing of the network 10% for marketing, community engagement, and performance reporting – this will drive digital transformation in the community, which in turn drives service sustainability, local economic growth, and community benefits. With market analytics and data on community impacts, elected officials and economic development professionals can identify evolving community needs, implement smart community services assessed to have the biggest impact on the community, and show community return on investment (ROI) in terms of business retention and growth, GDP and tax base impacts, quality of life benefits, etc. Continue listening to and assessing community needs to ensure your community continues to evolve and be a place where people choose to live and work! The drivers to move a locality through this process are economic and community benefits. When these drivers outweigh the costs of broadband and digital infrastructure investments they become the foundation for commitment and investment. 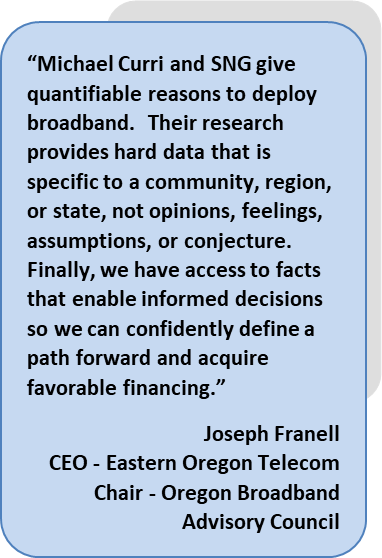 This has often been missing in the process and that is why SNG strongly recommends starting by educating with the Broadband Toolkit and assessing community benefits and the economic feasibility before investing in broadband and digital infrastructure. SNG’s suite of services have been designed to help you make the right decisions based on your needs and circumstances, no matter what stage you are at in the process. We have worked with network engineers and builders to develop a path forward that is streamlined, saving you time and money, so that your residents and businesses have the broadband they need to stay and thrive. SNG recommends starting with the Community Broadband Toolkit which is designed to help communities establish, or improve digital infrastructure and broadband services for the benefit of their residents, businesses, and municipality. The Toolkit builds upon SNG’s research studies and takes lesson learned from successful broadband projects conducted across North America. You know you need broadband, let us help you understand where and how you can build buy-in to develop a digital infrastructure strategy that is based on your needs and your circumstances.